Stock #4103, Retail Price $29.95. To buy a copy now, click here. 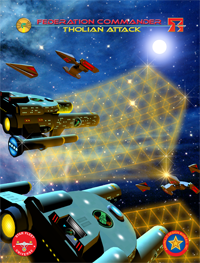 New Game Value: Fifteen new ships, five new scenarios. Rules for Web, Web Caster, Web Breaker, Shield Cracker, Particle Cannon. 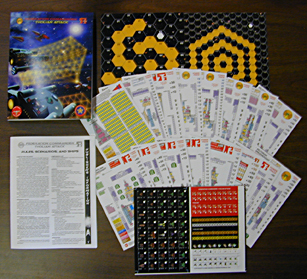 Components: 16-page Ship & Scenario guide, 108 half-inch and 40 one-inch full color die cut playing pieces, sixteen full color double-sided laminated ship cards, and two 8.5x11 hard-mounted double-sided map panels (with full-color webs). Neo-Tholian: NDN, NCA, NCL, NDD, NFF. Seltorian: DN, CA, CL, DD, FF. Weapons reference card, Base Station, Death Probe. 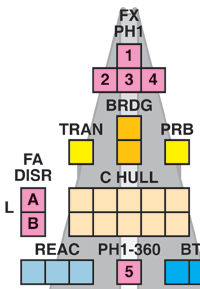 Boosters #13, #14, and #15 provide additional copies of the most often used ship cards so you can fly multi-ship squadrons, and entirely new ship cards. Stock #s 4213, 4214, 4215; $9.95. Border Box #5 provides 24 miniatures to match the ships in Boosters #13, #14, and #15. Stock number 4405; retail $99.95. To buy any of these products now, click here. 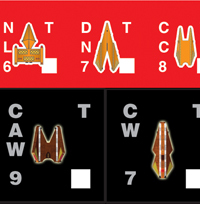 Klingon Border or Romulan Border includes all required rules for the ships in this product. This product requires one of those products or Academy.